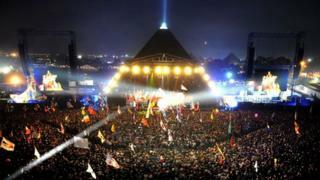 The BBC has unveiled plans for its first "truly digital" coverage of this summer's Glastonbury Festival. For the first time there will be 250 hours of live broadcasting from the six main music stages. Bob Shennan, the BBC's controller of popular music, called it a "monumental logistical challenge". This year's headliners are the Rolling Stones, Mumford and Sons and the Arctic Monkeys. It is the first time the Stones have played the festival at Worthy Farm, Somerset, which takes place on the final weekend of June. The line-up includes Primal Scream, Nick Cave and the Bad Seeds and Elvis Costello, alongside such chart acts as Professor Green and Dizzee Rascal. Also on the bill is Sir Bruce Forsyth, who will perform songs from his solo album These Are My Favourites. At 85, Sir Bruce will be one of the oldest performers ever to appear. Writing in the Daily Mail, he said the one-man show was "a bit of singing, a bit of dancing, a bit of piano (a lot of people don't know I play piano) and an awful lot of laughter, I hope". Announcing the Glastonbury plans on Thursday, Shennan revealed a new four-year deal had been signed to cover the event. This year's plans had been shaped by the experience of covering the London Olympics, he added. "We've learnt a lot from the experience the BBC had in 2012," he said, "We will be covering six stages and offering live streaming in a way we have never have done previously." The BBC's coverage will feature more than 120 live performances broadcast on TV, radio and online on four screens: PC, mobile, tablet and connected TVs. "Not only will this be the first truly digital Glastonbury, this will also be the first mobile Glastonbury," said Mark Friend, the man in charge of the BBC's multi-platform coverage. "We expect mobile and tablet viewing and listening to reach unprecedented levels, particularly over the weekend." Coverage across the weekend will appear on BBC One, BBC Two, BBC Three, BBC Four, Radio 1 and 1Xtra, Radio 2 and 6 Music. BBC One will include coverage in its mainstream programming, including The One Show and Songs of Praise. The BBC's presenting team includes Chris Evans, who will launch coverage on Radio 2 on 28 June, plus festival veterans Steve Lamacq, Mark Radcliffe and Jo Whiley. They are joined by Nick Grimshaw, Gemma Cairney, Lauren Laverne, Dermot O'Leary and Craig Charles. "In 1997, there was a two hour programme on the telly," said Lamacq. "Now it's going to be on virtually all the time." Jo Whiley predicted that the "big story" of the Glastonbury weekend would be the Rolling Stones' performance on the Saturday night. "I'm sure they would never have committed to doing Glastonbury unless they were 100% sure they could pull it off," she said. "So it's going to be fascinating watching that." The festival, set to be attended by 135,000 people, was not held last year because of the Olympics and to allow the farmland to recover from the 2011 event. "The BBC have stuck with us through thick and thin since 1997 and they've earned their stripes the hard way," said festival founder and organiser Michael Eavis. "It's been quite a journey since 1997, and to have a complete record of what we've been up to over the years is music history gold dust."